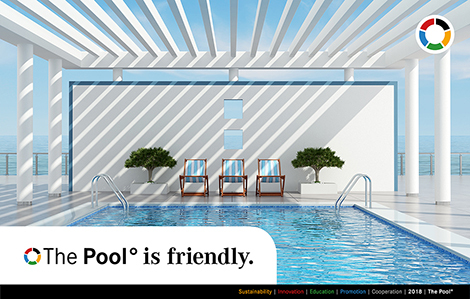 >> PNG: The Pool° is friendly. 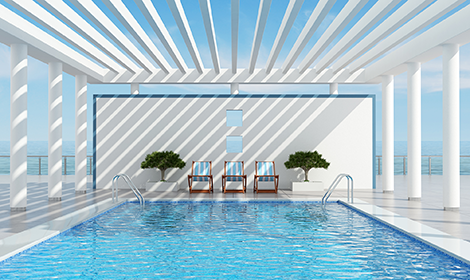 >> Then you will want to be part of the Pool°! Limited or stock-listed companies, etc. are primitive (capitalist) structures. 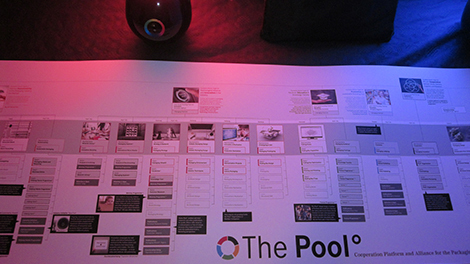 The Pool° Organisation is a new kind of entrepreneurial ecosystem, designed to accelerate Innovation for the ever-faster turning cycles of our new Millennium. While decelerating the people. Always think BIG. I am a creative Strategist & trained to think BIG. 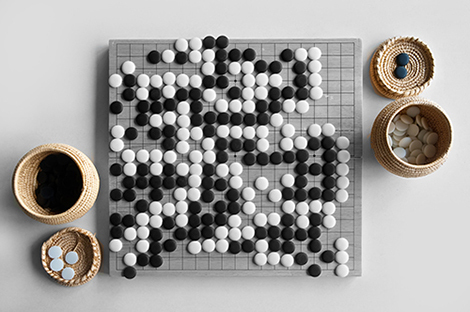 Creativity is my profession & I have played many, many strategy games. This is true for table top games (Chess / Risk / Axis & Allies / Battletech...) as well as games & simulations on the different home computers -- ever since there are home computers (Command & Conquer Red Alert II, just to name a favourite). In these games, I often was General, King, Emperor, God, etc. >> this is normal & daily business for me. As such a person, it seems strange to me to watch most other people only looking for the next income stream. Everybody is 'Entrepreneur' & thinking up new business models today. That is a great thing, if it is about innovative concepts that have been developed with the benefit of the PEOPLE in mind and not with maximum profit. But most businesses are all about maximising their sales figures. The Swedish Menswear label ASKET for example has a different goal. They want people to buy less clothes. 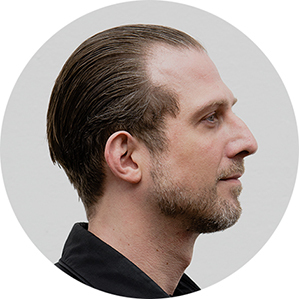 “Our end game is to curb the fashion industry and to slow down people’s rate of consumption,” says CEO and co-founder August Bard Bringéus. Now people will say "This will destroy even more jobs than will already be destroyed through Digitalisation!" Hopefully, yes. I imagine a future in which NOBODY needs to do work they do not like. This work will be done by robots. All the boring thinking will be done by AI also. 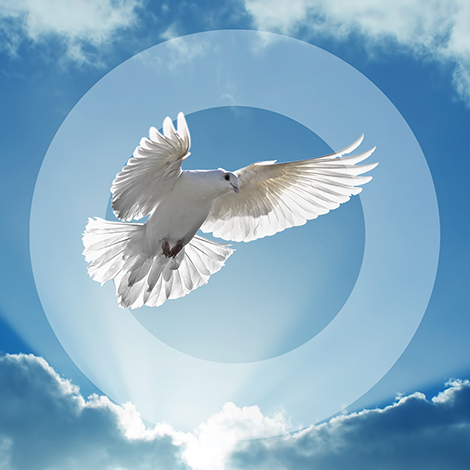 We will have time to enjoy life and discuss how we could make the World even better. Like with new concepts and business models. But these cannot solve the problems of unemployment & all the rest that we will have to face now together with the Fall of Capitalism. This fall cannot be cushioned by any business model. And we for sure do not want to install a Communist system. 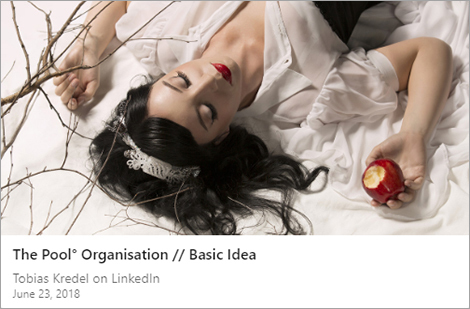 So the answer is a new KIND of Business ORGANISATION. 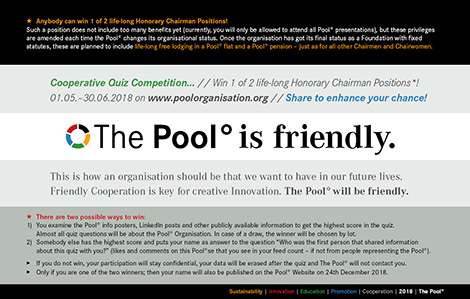 The Pool° is planned to be organised as a Foundation with several Chairmen representing Inner Circle and Founding Members. 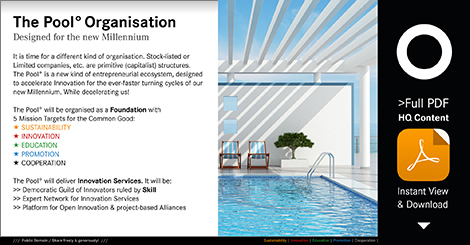 The organisation as a Foundation makes the Pool° a reliable partner with a fair working environment as well as a trustworthy platform for sharing innovation budgets for truly relevant projects. 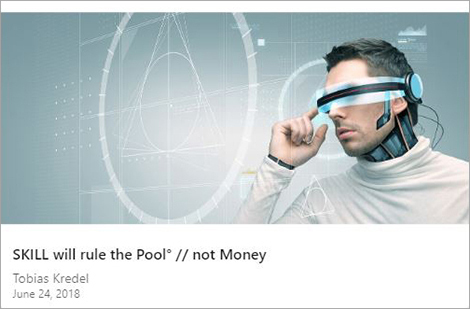 The Pool° is planned to act as a bank also, lending money to its other members (including freelancers) -- WITHOUT taking INTEREST, of course. 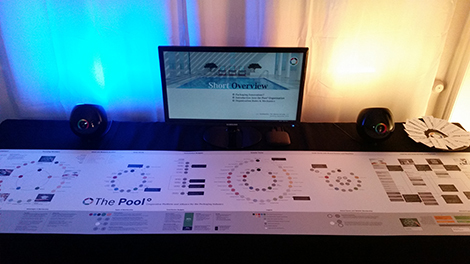 Each Member can decide how much of its Pool° budget will be made available for moneylending for other members. Do GOOD and TALK about it! Most Suppliers need the Pool° for Promotion and to participate in the Brand Owners Innovation Process through Pool° briefings. 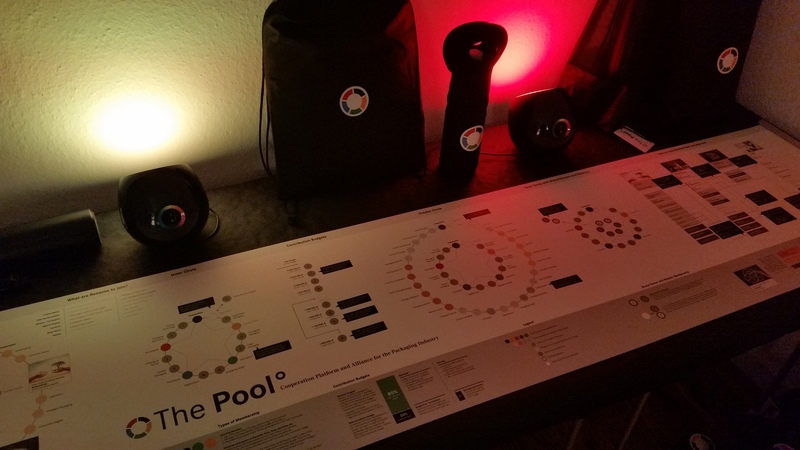 Creative Agencies and Service Suppliers profit from access to the Knowledge Tree° & Pool° Experts as well as enjoy the Design Pitch Ban for members. 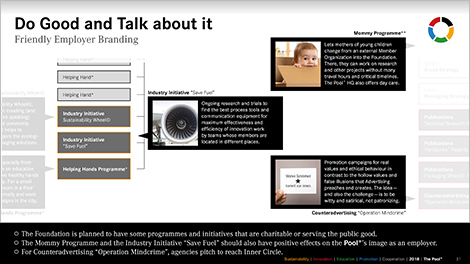 Brand Owners and Retailers get a Win-Win cooperation network for their innovation projects. The Pool° accepts briefings from Brand Owners and Retailers. 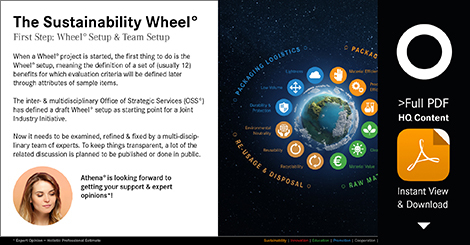 These briefings can be taken by its members, alone or together with shared project budgets. 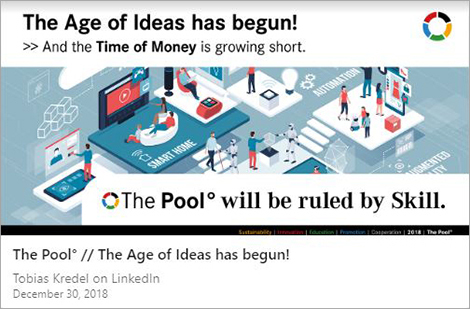 🌊WAVE°App >> The Pool° Organisation Smartphone App as Easy Entry point for the Pool° Organisation will allow ANYBODY to join the Pool° (on a first level) & then use the app in combination with & parallel to LinkedIn for TIME recording & as an electronic purse // account for Pool° CREDITS, based on Blockchain technology. 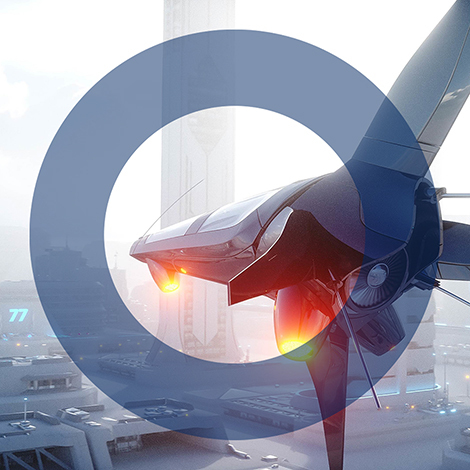 On a second level, it will allow FREELANCERS to get different levels of CERTIFICATION for their recorded time. On levels higher up, the app will be used by the staff of the Pool° Organisation itself for the Certification of Freelance EXPERTS. 🌐 DISRUPTIVE!!! >> This app will allow people to record the time that they invest for the COMMUNITY -- and get it certified. Certified TIME can be traded against TIME of the same or other levels of certification -- or exchanged against Pool° CREDITS. Which can also be bought with MONEY. We need an app developer and/or sponsor who is ready to conquer the WORLD. Please contact us if you want to finalise the concept with us. Please note that we have NO MONEY. You are doing this for MANKIND! 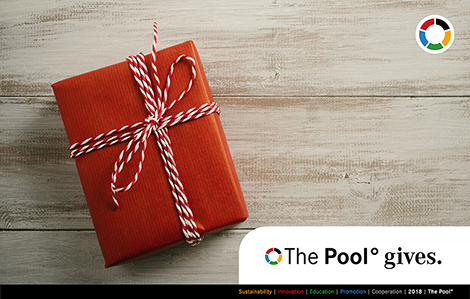 ⛲ The Pool° Foundation statutes are planned to be made available as Public Domain, so that this new kind of organisational structure can be used for the benefit of any other industry that has similar challenges like the Packaging Industry. 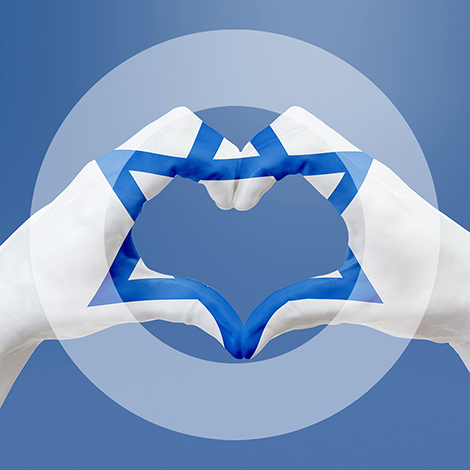 The concept is perfect for ISRAEL in many ways. First of all, Israel is a nation of Scientists, Developers & Engineers that depends on Innovation. And the Jewish People also know that it brings Good Luck to give money to Charity. 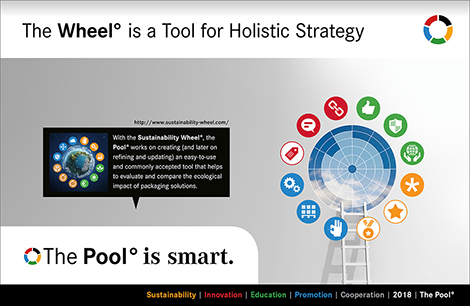 The Pool° will have several programmes that target the Public Good. 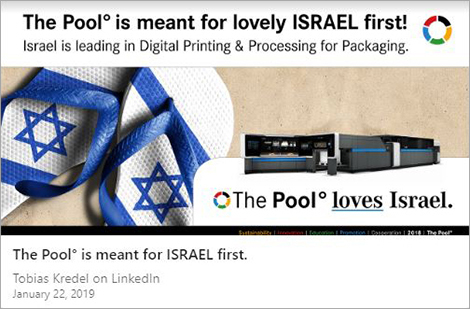 The Pool° Organisation is meant for ISRAEL first. It was designed with the FMCG & Packaging Industry in mind. And Israel does not only lead the world in the percentage of plastic bottles it recycles. Israel is leading in Digital Printing & Processing for Packaging. Israeli inventor Benny Landa revolutionized the world of digital printing when his Rehovot company, Indigo, launched the E-Print 1000 in 1993. It was a turning point for the printing industry, enabling printers to print directly from a computer file. Landa has more than 500 patents to his name worldwide & is still leading digital printing with his company's new development, nanography digital printing. 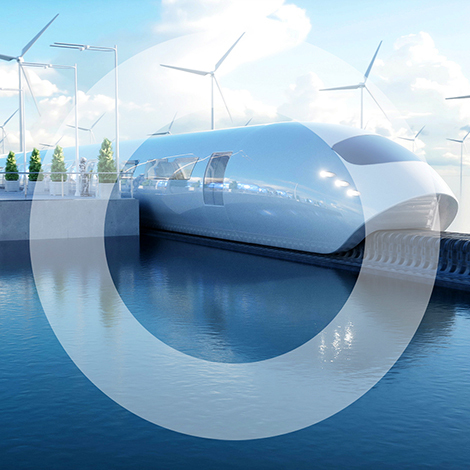 In combination with digital processing like laser cutting (where Highcon is leading, another company associated with Landa) this is is requirement for many future packaging innovations. If You would like to book The Pool° for Your (Future of Work?) Event, You can do that! 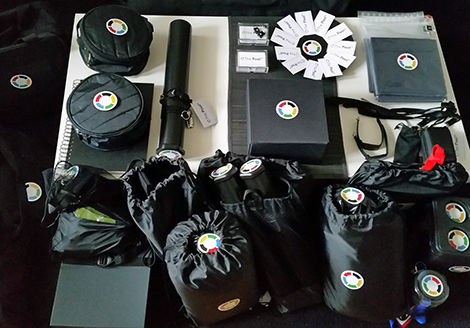 We have all the materials ready to fill a normal-sized Meeting Room with Science Fiction atmosphere. During the Roadshow, we are looking for possible Founding Chairmen. 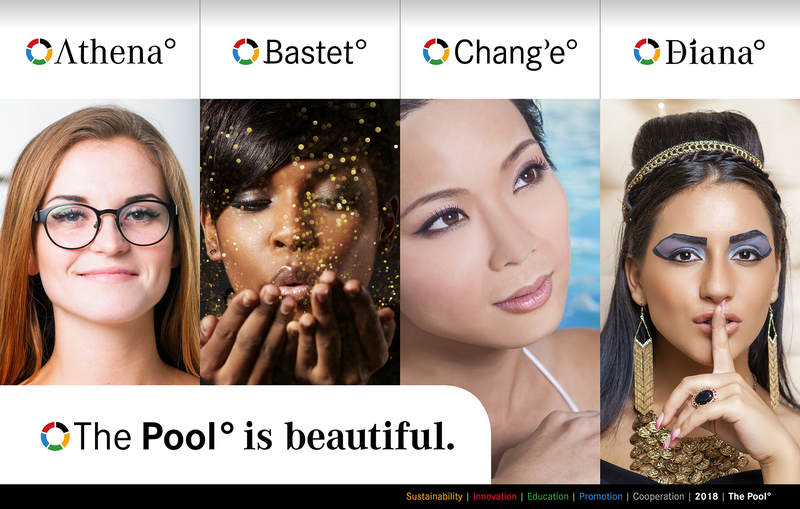 Beautiful people will be there to explain the Pool° -- Male and Female. We welcome EVERYBODY to think up similar ORGANISATION concepts. We are here to learn and we best learn from each other. Please send an e-mail with a proposal for a TC timing. My time zone is Hamburg, Germany (+/-0 CET). 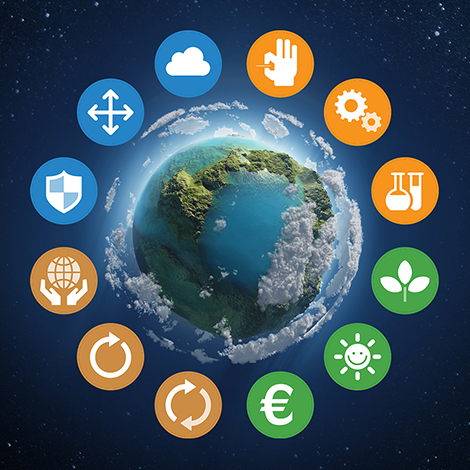 WHAT IS SUSTAINABILITY IN PACKAGING? This is a good question actually. And one that is not easy to answer. There are many opinions about this, most of them biased. As long as there is no commonly accepted truth, people of course support their own products. >> PNG: The Pool° is smart. as the name of the Second Honorary Chairman. Almir works in Textile and Clothing Innovation and Development, so it looks like we will be starting by integrating this industry as well. Good choice of Fate, as this is also an Industry that everybody can connect to, similar to FMCG & Packaging. Click the thumbnails to open the example presentations in the right frame or click the titles to open them in a new window. There are of course no strings or newsletters or anything attached. >> PNG: The Pool° is beautiful. 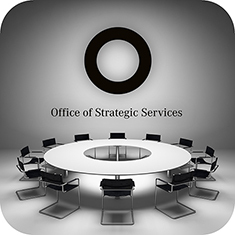 The Office of Strategic Services (OSS°) is my website as Freelance Presentation Designer & Multidisciplinary Packaging Expert & Strategist. 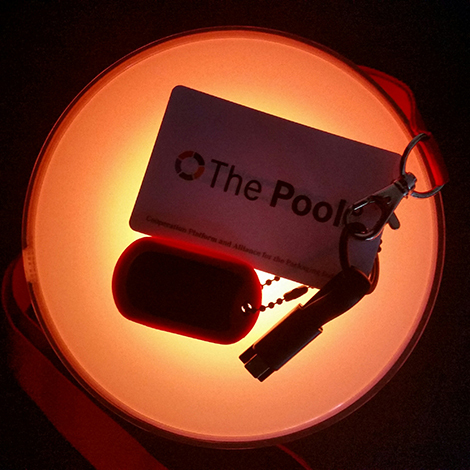 The Pool° is on LinkedIn. 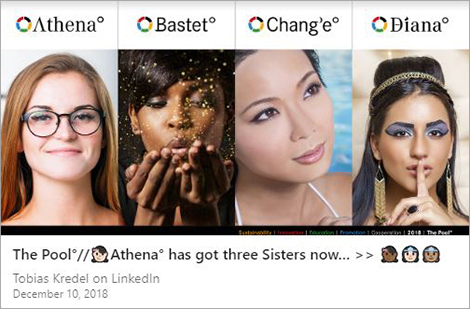 But if You feel stressed from too much Social Media or if You are even suffering from acute LinkedIn Agitation Rapidfeed Syndrome (LARS), please watch the video with the music (🎧?). Fix Your eyes to the two outside ○ circles and think of ○ nothing. 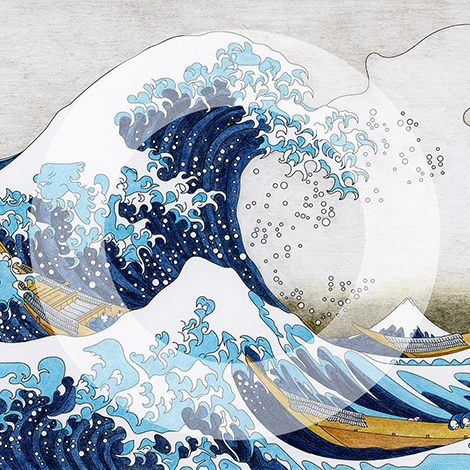 After 5 minutes, Your mind should be calm & decelerated (=sharp & creative)! 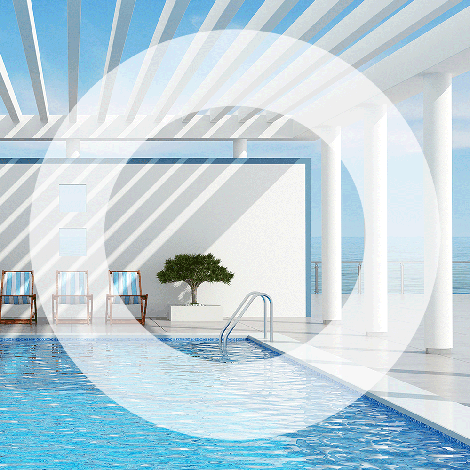 The great, decelerating music You can hear is our licensed Pool° Experience Ambient Track ‘The Infinite’ – written, composed and produced by Thomas Lemmer and part of his Album ‘PURE’.